Two-color Folder Icons - 182 bicolored folder icons that will help you to put things on your computer in order. 182 bicolored folder icons that will help you to put things on your computer in order. In the ordinary world, we're accustomed to using markers, highlighting important documents or laying them out in folders of different colors. This allows us to quickly find the information we need. Then why do you keep storing your computer files in the same old yellow folders? This icon set helps you highlight important folders with bright colors so they're easier to find. The pack also contains two-color folders for people who want to build a more color-marking system. 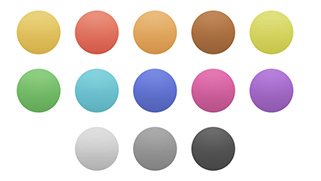 c)	And 156 folder icons of all color combinations. Who might be interested in this pack? Unlike simple folder coloring, this pack will be useful to anyone who wants to use 2 criteria for color coding at once, or whose documents can go under two different categories at the same time. So, for example, in genealogy you can use two-color folders to keep documents about a relative who belongs to two family branches marked by different colors. An education plan can be visually distinguished not only by the names of the subjects, but also by months, etc. What are the advantages of the Two-color Folder Icons pack? All icons were created by the professional design studio, IconDesignLAB.com. This is why they look accurate when you zoom in or out on them. As you can see, the location of the folders in the set resembles a table. At the intersection of each row and column, there is a folder that combines 2 colors. This is a key characteristic of the "Two-color Folder Icons" pack, which allows you to use 2 colors to mark folders whose contents belong to several categories. Thus, having 182 icons in stock, you can easily color-mark even a complex system of folders. You won't waste time by marking folders. Together with this set, the assistant program, Folder Marker, will help you to mark all your folders in just a few minutes. To work comfortably with the Two-color pack of icons, you will need the Folder Marker program. It will allow you to color-mark folders on your computer in just 2 clicks. Moreover, it will allow you to mark folders not only with colors, but also with different status images. 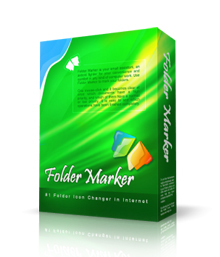 Folder Marker Pro is the most advanced version of the product; it offers many additional features, including a license to work not only at home, but also at the office. The Pro version allows you to make a backup copy of marked folders, transfer them to another computer, or restore your marking after reinstalling the system. Mark your folders in just a few clicks. 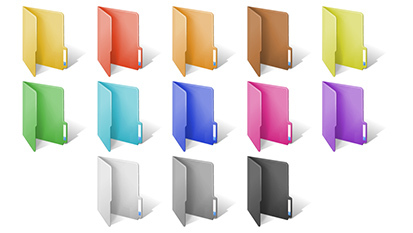 Create your colorful and organized system of electronic documents with Folder Marker!